Two weekends ago, Uncle Matthew came home for the weekend. We had a great time. Matthew was able to go to MJ's Gymboree class. Michaela introduced him to her teacher, Miss Lisa. Matthew and MJ had a blast at Gymboree. We love you Uncle Matthew. Hi Michaela. There's nothing like a visit from your most favorite uncle! I have been having so much fun with my Uncle Adam. Mommy thinks that he took a very nice picture of me today on my blog. 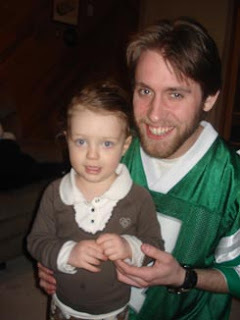 Your Uncle Matthew and my Uncle Adam are very cute!!! !